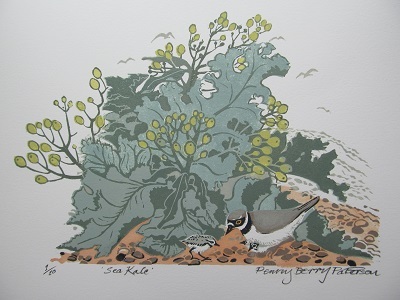 I began linocutting in Salisbury in 1960 and continued at Brighton School of Art. 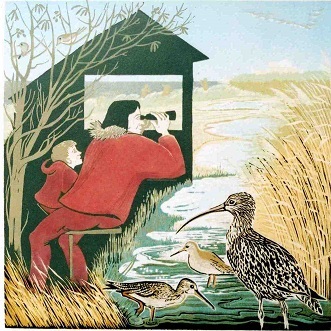 From 1985-88 I specialised in Printmaking at North Essex School of Art, Colchester. Here I learned the skills needed to produce multi-coloured prints from several blocks, printing different colours from each cut block in register (ie the edges of each part of the final image coinciding exactly with one another). I found a large but inexpensive printing press and set up my own workshop at home near Sudbury in 1990. As a printmaker I enjoy producing relief prints from lino, wood and card, and I am constantly looking for materials and methods that will extend and enhance the way I portray my subjects. The surface of lino has no texture to distract from the shapes left after cutting with U and V shaped gouges, so when the remaining surface is rolled up with ink and printed, the resulting image has a solid, un-textured quality. Torn card and paper sealed with PVA glue produce a random textured half-tone image when printed from, useful for portraying cloudy skies, since only the high spots of the surface are touched by the ink roller. The grain pattern of a sheet of plywood introduces its own texture into woodcuts, but the brittle nature and direction of the grain must be taken into account, often making the image even more stark and direct than one cut from lino.